Remember Yuka — that freakishly well-preserved wooly mammoth discovered in 2010? Scientists have put the remains of the 39,000 year-old mammoth on display in Moscow — and it's far more incredible than we realized. The young female mammoth was discovered in 2010 in Russia's Arctic Circle. It just arrived from Japan on the latest, week-long leg of a wildly successful world tour. To keep it from decaying any further, Yuka is kept inside a cryo-chamber where the temperature is kept at a steady -18 Celsius. Featuring shocks of red fur, the mammoth weighed about 220 pounds (100 kg) and was likely between six and 11 years of age at the time of death. 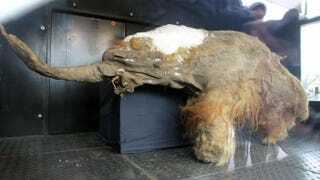 Incredibly, Yuka had an intact brain, the first time such an organ has been found in a mammoth. Evidence suggests Yuka had a tough life. Scars on her skin indicate an attack by a now-extinct cave lion. But despite getting lucky once, she wasn't able to manage a later escape; she had a broken leg and a series of unhealed bites, indicating she might have been pursued in the moments before her death.